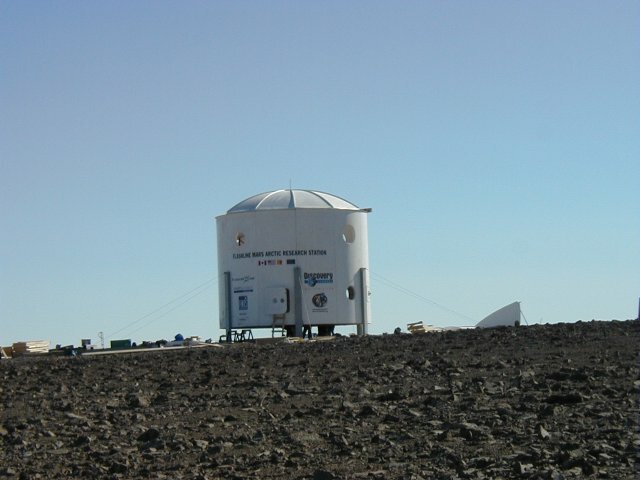 The Mars Society is requesting volunteers to participate as members of the crew of the Flashline Mars Arctic Research Station during an extended simulation of human Mars exploration operations on Devon Island during the summer of 2001. It is anticipated that the field season will run from late June through late August; volunteers should state during what segments of this span they are available. Both volunteer investigators who bring a new proposed program of research compatible with the objectives of Flashline Station, and volunteers simply wishing to participate as crew members supporting ongoing investigations will be considered. Applications will be considered from anyone in good physical condition above 18 years of age without regard to race, creed, color, gender, or nation. Scientific, engineering, practical mechanical, first aid, wilderness, and literary skills are all considered a plus. Dedication to the cause of human Mars exploration is an absolute must, as conditions are likely to be tough and the job will be very trying. Team spirit is essential. Those selected will be required to participate in short (a few days) crew training exercises to take place in the western United States during the spring of 2001, and to act under crew discipline and strict mission protocols during the field season on Devon Island. The Mars Society will pay travel and related expenses during training and field deployment, but, aside from potential student stipends, there will be no salary. no later than January 31, 2001. Total length ofapplications should not exceed three pages. Please include seven copies of the entire application in addition to the original. Submitted applications will be reviewed by members of the Flashline Management Committee. Applications will NOT be accepted by email.